As a Licensed Taxi and Private Hire company in Bournemouth, we pride ourselves in offering a fast and reliable service with a guaranteed 10% discount on every fare. 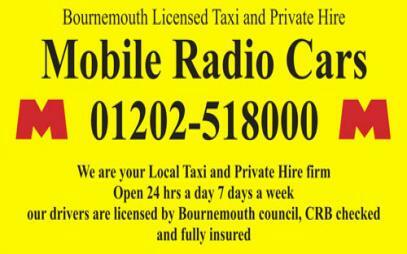 Mobile Radio Cars has been an established taxi company in Bournemouth for 35 years, and has a large enough fleet to cope with even the busiest saturday nights. All our drivers are licensed by Bournemouth Council, CRB checked and fully insured.